I try to avoid doing stories on PETA wherever possible because I realize most of what they do is for one purpose — to gain publicity. When you think of Jon Gruden, you think of the guy known as Chucky who can get off legendary rants. One fan was not happy with ESPN’s decision to replay San Diego’s touchdown catch by Legedu Naanee. How did he know they were replaying it? No clue, but he expressed his displeasure. It looks like police officers out in Las Vegas finally tracked down Floyd Mayweather Jr. It also looks like he couldn’t care less that he’s been arrested. No, not like that. 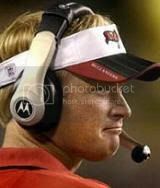 Not mic’d up like a head coach would be mic’d up on the sidelines. What could be heard was probably just as intense, however. To the above left is a picture of LeBron James’ old signature. To the above right, LeBron’s new signature.